Don't be a Scrooge...be an Ebenezer. I know, I know, they're both the same person...right? 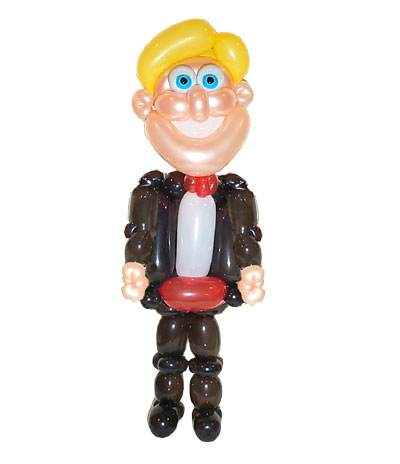 I don’t know if you know this, but I used to be one of the top balloon artists in the world. I didn’t ask to be, it just happened. It, therefore, became my duty to walk around all day with balloons in my pocket, just in case the need for a balloon arose. For example: I would be in a grocery store and a little kid would be getting impatient, whiny, or downright tantrum-ish in his/her surroundings. The mother (parent) would be frustrated, trying, subtly, to discipline the child so that no one in the store would call child social services, and, at the same time, put all the grocery items on the conveyor belt to be priced and bagged. Usually, at this point, I would pull out my stash and ask the parent if it was O.K. for me to make the child a balloon-something-or-other. The mom (or dad) would consent, especially when they saw that their child had diminished, somewhat, in his/her conniptions as soon as I pulled out the balloons. I would make something simple and give it to the kid. The kid would be happy (usually) and we would all celebrate the a win/win/win/win/win situation…just from one simple little balloon. So what were the win/win/win/win/win’s? Win #5- I was happy because I made everybody else in the store happy!! And that’s the real reason I did it…so I could be happy!! Me, me, me. It's all about me!! Is that selfish of me? I don't want to think it is...but you bet your bootie it is!! In this situation, my act of selflessness is very selfish!! I don't want to be alone in my selfishness. I want you to be selfish. You should be selfish, you need to be selfish, you must be selfish…but only if you’re doing it for the right reason. If you do not know the story of "A Christmas Carol" by Charles Dickens, here it is in a nutshell. Ebenezer Scrooge was a miserable, miserly person. He was visited by four ghosts who showed him his past, present, and future. He realized he was not the person he wanted to be and changed his whole attitude. He then was the most caring and giving person that any had ever seen. His persona, at the beginning of the story, created such a negative image of him, that nowadays if you see a person who is stingy, obnoxious and selfish, they are often contemptuously referred to as a Scrooge. But I submit to you that after the 4 ghosts came to him that fateful Christmas Eve, that Ebenezer changed into someone who was selfish in a good way. He became a selfless, wonderful, loving, giving man…WHY? It made him feel good!! It wasn't because he was afraid to die alone as the story leads you to believe. That kind of fear only carries you SO far. He loved the feeling that he got every time he was nice and caring. It made him giddy, giggly, and glad. So, NOW, in my opinion, I think that a person who is giving, compassionate, and loving should be referred to as an Ebenezer. There is a lot more to be said about being selfish...but if you take it down to the nitty-gritty, then know this: You will not get that feeling unless you are helping others. That amazing feeling only happens when you are in the service of your fellow beings. You do not get that feeling from any other place. Be an Ebenezer...not a Scrooge!! You will live happily ever after, and that's what we ALL desire! !